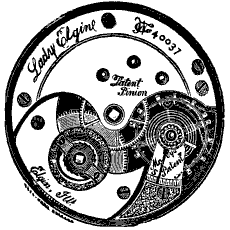 Early on, Elgin produced a series of size 10 ladies' watches, which had the names of "Lady Elgin", "Frances Rubie", "Gail Borden" (yes, the man of the condensed milk fame), and "Dexter Street". There appears to be a lot of confusion in Elgin's documentation about the "Frances Rubie" grade, the "Lady Elgin" grade and the numbered grade of "23". No matter how you slice it, Elgin has contradictory information about these grades. This document tries to lay out the facts and draw some conclusions about what is really going on here. This document is really more of a set of working notes that I have periodically updated as I find new facts. The results are fairly confusing because the subject is confused. If I knew how to make sense of this information, it wouldn't be a puzzle. One of the things that impresses me about Elgin is that, while other watch manufactures have many similar types of errors in their documentation, this is the only example of an error in Elgin's documentation that I couldn't fairly quickly and easily explain. As I have learned more about Elgin watches, this puzzle has become more of a glaring exception and I wonder what may have happened to cause this mess. As kind of a side puzzle, I have found no information on where the "Frances Rubie" name came from. Most other Elgin Names have at least a plausible explanation. Was it a made up name? From what I can tell, there were no important figures in the Elgin organization named "Rubie". Was "Frances Rubie" someone related to someone in the company? Considering that it is the highest grade 10s watch that Elgin made, it is puzzling that so little is known about the name. The oldest info I have is from the 1888 Elgin Material Catalog, however, the newest grade 23 "Frances Rubie" was from 1875, some 13 years earlier. That is a long time, I would think, even by the slower paced standards of yesteryear. The 1888 MC doesn't even have that much information, you really need to go to the 1896 MC, which is another 8 years later. The following section contains all the relevant facts that I could find on the subject. Please let me know if you have something to add. The actual watches, of course, are the most important facts, however these 10s keywind watches are not considered as collectible as many other watches and not a lot data has not been collected and distributed about what has actually been seen. For quite a while I have heard rumors that all of the known Frances Rubies have been from the first run and that none have shown up in the last two runs. While I still don't have very much data, I have now talked with enough credible sources who confirm this rumor that I have begun to believe it. If this is true, much of the "confusion" changes form "what did Elgin do? ", to "what was Elgin thinking of doing or thought they did?". The Lady Elgins that have been seen also differ from the documentation. Greg Frauenhoff reported to me that he has some Lady Elgins and they are 15j, not 11j as is documented below. This led me to check my own Lady Elgin, and sure enough, it is also 15j. Since checking to see if a watch is really 11j or 15j takes either very careful examination (if you know what you are looking for), or removing the dial (if you don't), it will be hard to collect a lot of data about whether all Lady Elgins are really 15j or 11j. 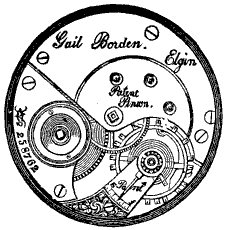 The drawings of the Gail Borden watches that are in many of the early Elgin advertising do not match the actual plate layouts of the watches that I've seen. The actual watches have the same plate layouts as the Dexter St watches. The so-called Elgin Master Records do not shed much light on this puzzle. In fact, it gives more contradictory information about these 10s grades. The description of the jeweling on the grade 22 Gail Borden says that there are jewels on the top and bottom of the escape and fourth wheels. This gives the right jewel count of 11 but it does not match the jewel locations of actual watches and the jewels on actual watches are bezel set rather than having screwed in jewel settings. The jewels on actual watches are also not screwed as the records say. The grade 23 Frances Rubie is said to have "Lady Elgin grade material", but the grade 29 Lady Elgin is said to have "Gail Borden grade material". The grade 29 Lady Elgin has similar errors in the documented locations of the jewels and the existence of jewel screws, and it also gives a jewel count of only 11 instead of 15. The other details about these 10s watches match the 1896 Material Catalog, including jewel counts, use of jewel screws, the class number, etc. The version of the 1888 MC that I have is in the 1890 King & Eisele jewelry supply catalog. Although the catalog says that it is "a complete reproduction of the Elgin Company's New List arranged in their order and with their numbers", it does not have a serial number list, and I'm not sure that all pages were actually reproduced. There is no list of grades, many parts are listed by grade name and the use of the term "class" is completely different than the way it is used later in the 1896, 1904 and 1915 Material Catalogs. While there isn't a table with a list of grades, there are some parts (e.g. the mainspring arbor) that are found on all watches. Parts such as these can be used to create a list of all grades. Almost all of the named grades have their equivalent grade number listed. The only exception is that most of the 10s movements are listed only by their grade names. The exceptions to this exception are the grade numbers 53 and 54, which are the only 10s watches that didn't have grade names. There are also some grade numbers that are not listed at all. These are all keywind grades, most of them are either have an unusual size (17s, 14s, 12s), or had very low production (less than 2000 made), or both. The only exceptions to this are the 10s grades, none of which had grade numbers listed even when they had very high production. The 10s grades are the watches covered by this document, so the exceptions mentioned above make them really stand out. The 1888 Material Catalog doesn't directly list the number of jewels that a grade was supposed to have, however a maximum number of jewels can be determined by checking which grades are listed as having which jewels. Unfortunately, it is quite possible that at least some watches of a particular grade won't use all of the jewels. There are other grades that known to have a variable number of jewels, and these grades list all possible jewels. So, by checking the jewels, we can determine that both the Frances Rubie and the Lady Elgin can have up to 15 jewels. Grade "F. Rubie" is in class "46"
Grade "Lady Elgin" is in class "47"
Grade 23 is in class "47"
Grade 28 is in class "48"
Grade 29 is in class "47"
There are no numbered grades that are listed as being in class 46. This is the only such case. All other "named" grades (such as BWRaymond, HHTaylor, etc.) have a corresponding "numbered" grade that matches up. Table "Class of Material and Movements Used In" found on many pages including page 15 as well as pages 5, 6, 8, 10, 12, etc. Class 46 is said to contain just the grade "Frances Rubie", with no numbered grades. This is the only such case. Class 47 is said to contain "Lady Elgin, 23, 29"
Class 48 is said to contain "Gail Borden, Dexter St., 21, 22, 28, 53, 54"
When Elgin listed a grade name for a run in the 1896 MC, it is rare to find a movement that wasn't so marked. (Most of the exceptions are private labelled movements.) However, when they listed a grade number, it could either be marked with a name or it could be nameless. For example, the run starting at SN897001 is marked as just grade "69", but the two examples from that run that I've seen are both marked as BWRaymond. Another example is that all runs of grade 70 were marked with just the grade number, but when I've seen them, they have all been marked as BWR. Basically the exact same data as the 1896, with just new grades added. The only real change is to the "Grades of Movements with Classification and Description as Originally Made" table on page 5, which now lists the number of jewels that each grade has. This table says that the "Lady Elgin" as 15j and class 47. The only two grades in class 47 are grade 23 (which is listed as 15j) and grade 29 (which is listed as 11j). Like the 1904 table, the 1915 MC lists the "Lady Elgin" as being 15j and in class 47, grade 23 is listed as class 47 and 15j, and grade 29 is listed as class 47 and 11j. This contradicts the "Class of Material" table mentioned below. similar to the 1896 and 1904, except class 47 shows grade 28 instead of grade 23. Grade 23 appears no where in the table, and grade 28 appears twice, once in class 47 and once in class 48.. In the "Grades of Movements" table, grade 23 is listed as being in class 47, and grade 28 is listed as being in class 48. There is no mention of "class" anywhere, and everything uses the grade number, not the grade name. All runs of the "Frances Rubie" grade were changed to grade 23, with no indication that some runs were listed as being in different classes in earlier MCs. All runs of the "Lady Elgin" grade were changed to grade 29. The 1950 MC lists jewels and jewel screws for the escape and fourth wheels for the grades 22 and 29, just like the master records, but again, this is not what actual watches have. Early on, Elgin didn't have grade numbers, just grade names. The numbers were assigned later, probably around 1875-78. At that time, Elgin went back and retroactively assigned grade numbers to the movements that previously only had a grade name. 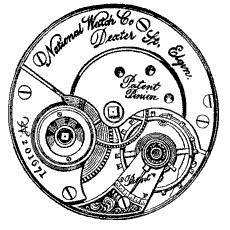 This is why the first watch that Elgin produced (an 18 size B W Raymond) is labelled a "grade 69" movement instead of the more expected "grade 1". In the 1896, 1904 and 1915 Material Catalogs, Elgin would list a "name" by the serial number range only if that range was the "first grade" to use that name. Otherwise, it would list the grade number. So the first BWRaymonds are listed as "Ray." instead of grade 69. Later grades that were also named BWRaymond, such as the grades 70 and 27, were listed with those grade numbers in the serial number lists. In the following excerpt of the serial number lists, if the name is listed as "None", it means that the serial number listed just the grade number, while most other runs listed a name. If there is no name mentioned, it means that all references to this grade had just a grade number listed. Note that many of these runs aren't a full 1000. This is somewhat strange, but this did happen fairly often this early in Elgin's production. Within this range of only 15,000 watches are the last two runs of the grade 23 "Frances Rubie". This range also has the only runs of grades 21, 25, 26, 30, 31, and 32 that Elgin made, all but one run of grade 24, and the first run of grade 53. 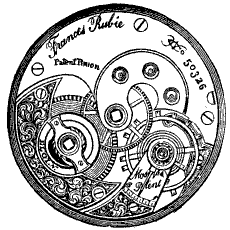 Grade 23 is thought to be a Frances Rubie, but the run starting at 360,001 is the only run that is marked with a grade number instead of a name in the turn of the century material catalogs (1896, 1904 and 1915). The same goes for grade 22 ("Gail Borden"), grade 28 ("Dexter Street") and grade 29 ("Lady Elgin"). They all are normally marked with a name, except in this range of serial numbers where they are shown with a grade number. In the 1888 Material Catalog, there are some grade numbers that don't show up as having any parts. In the above list, only the grade 53 shows up as having parts. Of the grade numbers that aren't listed in the 1888 MC, all the 10s and 12s grades show up in the above list. Over the last several years, I have come to several different conclusions about what all this means. As I mentioned in the beginning, this webpage is more of a set of working notes, than any sort of final word on the subject. I have left the previous "conclusions" in so that you other possibilities to think about. The Frances Rubie is grade 23, class 46. This would add a grade number to class 46 which previously had none. The "Classification of Movements" table in the 1896, 1904 and 1915 material catalogs should not show grade "23" as being class "47", rather it should show it as class "46"
The "Class of Material and Movements Used In" table in the 1896, 1904 material catalog shows class 47 as having grade 23 when it shouldn't. They also show class 46 not having grade 23 when it should. In the 1915 Material catalog, the equivalent table shows class 47 as having grade "28" instead of "23", but it is basically the same error. The Serial Number lists in the 1896, 1904 and 1915 material catalogs show the range "360,001 to 361,000" and "375,000 to 376,000" as being being grade 23 or Frances Rubie, but since no watches from these runs were produced, these runs should have been omitted. The Lady Elgin is grade 29 and is 15j instead of the 11j that grade 29 is listed as in the 1904 and 1915 MCs. When I learned that Lady Elgin watches were 15j watches rather than 11j watches, I had the following theory. One of the advantages over the earlier theory was that it required fewer things to be "wrong" with Elgin's documentation. There were two "Lady Elgin"s, one being grade 29, and the other being grade 23. It is not clear what, if anything, is different about these two grades. Grade 29 should be listed as being 15j not 11j in the 1904 and 1915 MCs. The 1950 Material Catalog should have listed the extra jewels and third wheel jewel screws for the grade 29 that the grade 23 has. My first theory was as follows. The Serial Number lists in the 1896, 1904 and 1915 material catalogs show the range "360,001 to 361,000" as being in class 47, when it should be in class 46. The Lady Elgin is grade 29 and is 11j, not 15j as listed in the 1904 and 1915 MCs. This web site runs on 100% Open Source Software. This web page was last changed on 05/10/2004 at 12:34:08.